Andrew and I got engaged whilst on holiday in beautiful Taormina in July 2017. Whilst we were there, we saw several weddings taking place and Andrew had half-jokingly suggested we go back and get married there ourselves. I thought it was a fantastic idea but wasn’t sure we would be able to pull it off. It was then that I came across Isabella and Tony’s website. Encouraged by the positive reviews on their site, we sent an initial enquiry one evening, and heard back from Isabella the very next morning. From the very first email, Isabella came across as approachable, knowledgeable and helpful, even offering to chat over the phone after work one evening so she could answer any questions we might have. Once we had chosen the date, Isabella confirmed the venue had been booked, and then gave us suggestions for the reception, flowers, photography etc. We never once felt pressurised, and we were given options to suit all price ranges. Isabella also recommended accommodation for us and our families, and booked us the most wonderful apartment with beautiful sea-views and gorgeous gardens, perfect for pre-wedding photographs. The whole process felt very relaxed, with Isabella guiding us through the paperwork requirements step by step, and she was always on hand to answer any questions we had. We had wondered whether we would need to make a trip over to Sicily before the wedding, but knowing Isabella was taking care of everything for us, it really didn’t feel necessary. Absolutely everything was taken care of – Isabella met us the day after we arrived and took us to sign the necessary paperwork at the town hall. She showed us round the venue and the stunning La Baronessa restaurant where we had our reception, and even arranged hair, make up and manicure appointments for the bridal party. She was on hand the whole time we were in Taormina, and nothing was too much trouble for her, including arranging a late check in to the apartment when our flight was delayed, and booking a mini-bus when some of our guests’ plans changed at the last minute. The suppliers Isabella recommended were of the highest standard – the floral arrangements and bouquets were absolutely stunning, the classic car was a wonderful touch, as were the Sicilian guitar duo, and the amazing folk bank kept our guests entertained whilst we were having our photographs taken. Max, the photographer was wonderful, he perfectly captured the day, and pulled out all the stops to have our pictures ready by end of the following day so we could take them home with us. Our wedding day went off without a hitch and that is all down to the planning and professionalism of Isabella. Words cannot express how grateful we are to you and Tony for helping us and our families have the most amazing day imaginable. We would recommend Isabella in a heartbeat. My fiance’s parents immigrated to the US in the 1950s from the Messina area, and much of his family still lives there. When he took me to visit them, I was enchanted by Sicily from day one. When he proposed six months later, we decided that it would be the perfect place to get married! From the outset, we intended to organize the whole thing ourselves. We found and booked a coastal venue for the reception but decided that we wanted a ceremony in spectacular Taormina. When I started researching venues and vendors, it wasn’t long before I realized we could really use some help. In my web searching, I had seen Wedding in Sicily Taormina’s website, and made an inquiry. Isabella’s kind and prompt response put me at ease right away. We enlisted her help with the ceremony and are so very glad we did - she helped tailor a truly unforgettable day for the two of us and our 110 guests! Isabella is poised, patient, and has solutions for every question with the invaluable insight of a local. From hairdressers, lodging and restaurant recommendations, florists, musicians, venues, transportation, to the rest of the never-ending barrage of details that factor in to a destination wedding - not only can Isabella help with all of it, every single vendor she provided was top-notch and wonderful to work with. Her love of Taormina and her work shines through it all, making her a true pleasure to work with. We faced a family health crisis shortly before the wedding that added a new dimension of stress to the planning efforts. As a result, many details came together at the very last minute; Isabella was able to help with each and every one of them. Her calm demeanor through the entire process truly made all the difference - from the months prior, to days prior, to the day itself - I cannot emphasize the value of this enough to someone considering organizing a wedding, let alone a wedding on another continent. 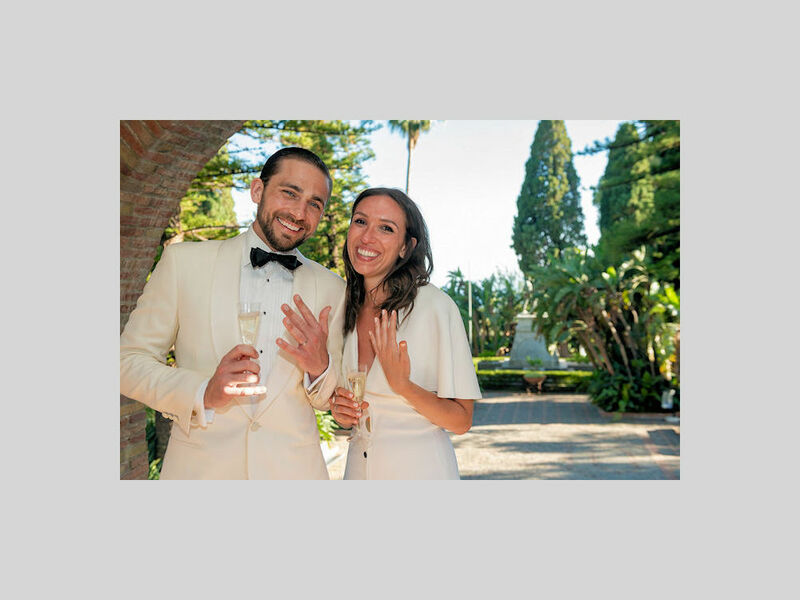 That said, if you’re considering having your wedding in Taormina, I urge you to contact Isabella, you can relax with the assurance that your dream is in expert hands. Our wedding day was nothing short of magical, a day that the two of us (and our friends and family) will treasure forever. Thank you, thank you, THANK YOU for everything you did to help make it the best day of our lives! 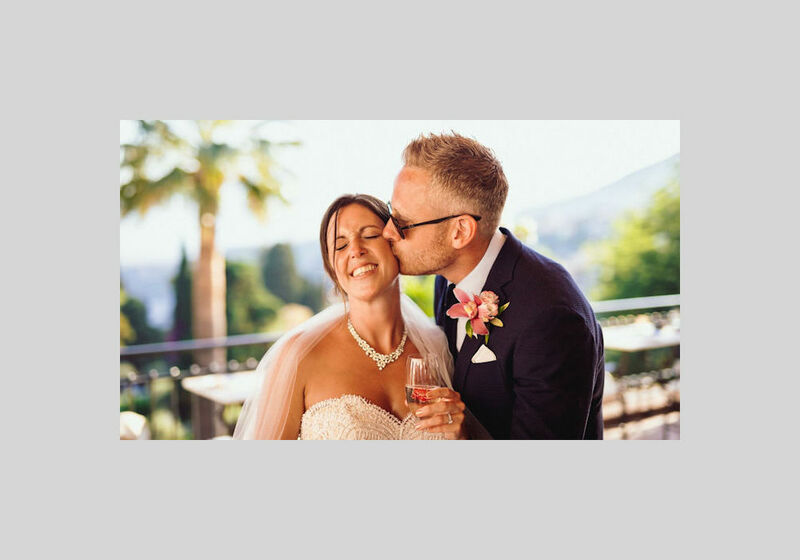 We are so glad that we chose Wedding in Sicily Taormina to help us plan our wedding, you will not find anyone more efficient, helpful or friendlier than Isabella and Tony. The wedding day was beyond perfect and more than we could of wished for! All of our guests commented on what a wonderful wedding it was and they were all extremely impressed with every aspect of the day and how smoothly it went. The musicians and photographers recommended by Isabella were superb, as was the reception venue, food, flowers and wedding cake. All were absolutely perfect, exactly what we wanted! 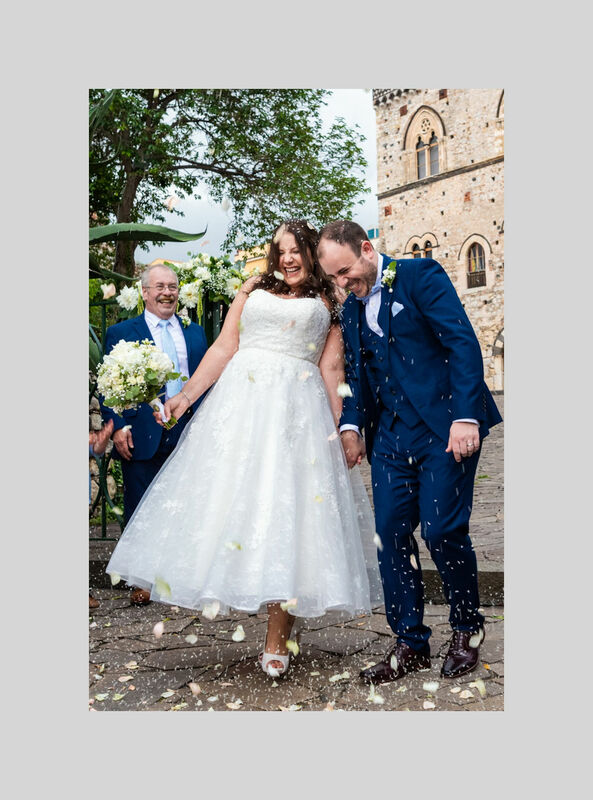 At the start we thought that getting married abroad might be a complicated, stressful process, but with Isabella and Tony it was most certainly not, it was completely the opposite. It was so straight forward and on the the day itself we all felt completely relaxed. We wish we could do it all over again! Isabella guided us through the whole process from the very start informing us when we needed to do certain things making it a very stress free process. Messages and emails were always answered promptly and clearly. Isabella stayed with us throughout the wedding day right up to the cutting of the cake to make sure everything went to plan which was very reassuring. You will not find a better wedding planning service than that of Isabella’s and Tony’s. We really can’t recommend them highly enough, they will definitely make your wedding dreams come true!! Isabella, words cannot describe our immense appreciation for your assistance in planning our special day on 14.09.18. When we first decided to have a wedding overseas in Sicily, the idea was very daunting as we didn’t know where to start with all the planning. We were so fortunate to have found your page and started communicating with you through WhatsApp and immediately felt as though we were in the right hands. From the start you were very professional and made our vision come to life. The day itself was not only amazing but seamless which is a testament to your excellent planning and knowledge of Taormina itself. From securing the church that we loved, to the restaurant and the beautiful flowers everything was lovely. The schedule for the day was perfect and ran so smoothly we both felt at ease we were in excellent hands and did not feel stressed on our big day. We thank you Isabella from the bottom of our hearts for planning, coordinating and everything you did for our wedding. We thank also your husband Tony who was also an integral part of the coordination of the day. 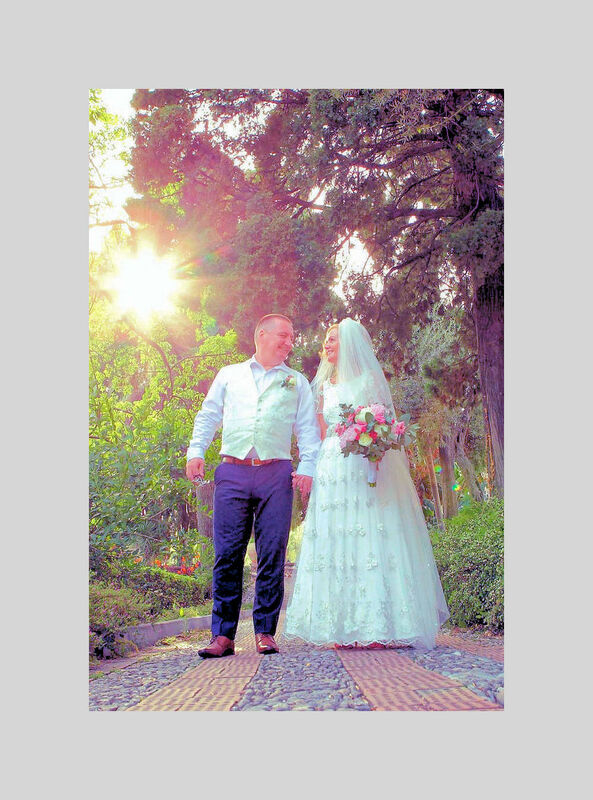 Thank you WeddingInSicily Taormina, we couldn’t have done it without you! While visiting Taormina in September 2017 to scope out venues for our wedding, I came across Isabella’s website www.weddinginsicily.co.uk and arranged to meet her during our visit. Being an Event Manager and Conference Coordinator in my job in Ireland I didn’t think I’d need a Wedding Planner apart from help with the Church / ceremony legalities… but boy was I wrong!! I had narrowed my online search down to 8 venues in Taormina and during our visit fell in love with the Grand Hotel Atlantis Bay and booked it immediately for September 2018. As I had booked the hotel (reception venue) myself I made all the arrangements directly with them. Isabella then emailed me her wedding file with all her services and costs. She explained the step by step process of the Church and legal “nulla osta” documents, when to apply for them, when and where to send them to and also details of how to complete the forms in Ireland, this was most helpful. Once we had completed and posted them to Italy she checked back with me to advise they had arrived safely and that all was in order. She booked our Church Santa Caterina, liaised with the Church secretary on our behalf, booked an English-speaking priest Father Carmelo (who was fantastic btw, and a great sense of humour) and our church music (cello and violin trio) all in the first week or two of contact. This put me at ease right away knowing all the important logistics were booked and confirmed. Isabella also contacted and booked the band SamarSax for us after we had spotted them in a bar during our stay and thought they would be perfect entertainment for our reception. She liaised with them regarding our preferred music and first dance song (this was needed and we were very grateful of Isabella as they didn’t speak a word of English!). Included in her services are wedding day transport, florist, hair and makeup artists, photographer and videographer and these were all recommended and booked by Isabella during the months prior to our wedding. And I could not recommend them enough…. The Videographer Francesco Carrabino and his partner Chiara are absolutely amazing, my guests all praised him and told me he was running around all day catching the best angles and moments! We even received a short video the very next day of our first dance which was absolutely fantastic!! I can’t wait to see the full day video!! Same goes for the wonderful Photographers Nicola and Cinzia! They were absolutely fantastic, and I barely noticed them running around all day but Cinzia is so lovely we were delighted with our package and photos. The florist did a magnificent job too with the church flowers and our bouquets and buttonhole flowers for the men. I had sent him photos of the type of bouquet I wanted and didn’t see them until the morning of the wedding and they were beautiful, absolutely spot on! We didn’t go with the suggested wedding cars as we had reached the max of our budget but instead Isabella booked an executive 8 seater car that was a brand new Mercedes and collected myself, my mum, 4 bridesmaids and flower girl from the hotel going to the church and this was perfect! Myself and my hubby and all our guests walked and took the cable cars down to our reception on the beach which was amazing and a lot of fun! We purchased the tickets in advance for all our guests the day before and it all worked out great! I had already found and arranged a hairdresser and trial in my trip over last year therefore I went with him for my bridal hair, but Isabella recommended a team of makeup artists and hairdressers for my mum and bridesmaids who came to the hotel the morning or the wedding and did an amazing job! All the girls were delighted with their hair and makeup. Make sure to have photos with you on your phone/tablet etc to show them as of course there is a language barrier... but having photos to show them worked out brilliant. When we arrived in Taormina the week before the wedding Isabella arranged to meet us and bring us to the registry office to sign our pre-marriage papers. I also had purchased large champagne balloons that I needed helium pumped into for the aperitif reception and she took this mission on at the last minute and managed to track down a service and got the balloons pumped with helium ready for the wedding day. We also arranged to meet with her the night before the wedding day for the Church rehearsal as the priest was not available. Isabella explained and talked us through the ceremony step by step. This puts the nerves and mind at ease and we were all very thankful. On top of all her services Isabella provided me with a list of all recommended hotels from 2 to 5 star for all our guests and airport transfer contact details to send to all our guests. I had a few large items (gifts and favours for our 75 guests along with a large box of mass booklets) that I didn’t want to take over on the flight or couldn’t for that matter due to weight, therefore I had them shipped from Dublin to Isabella and she kindly stored them until we arrived, this was hugely appreciated. Lastly, on the day of the wedding I didn’t know this, but friends told me that Isabella and her husband were in the Church early getting it organised, making sure everything was in place and most importantly clearing the constant flow of visitors (non-guests) out of the church right up to the last few seconds before I arrived. And she did this throughout the ceremony. The whole day went absolutely perfect and to schedule. I couldn’t have asked for anything more or would not have changed a thing! It was the perfect day! 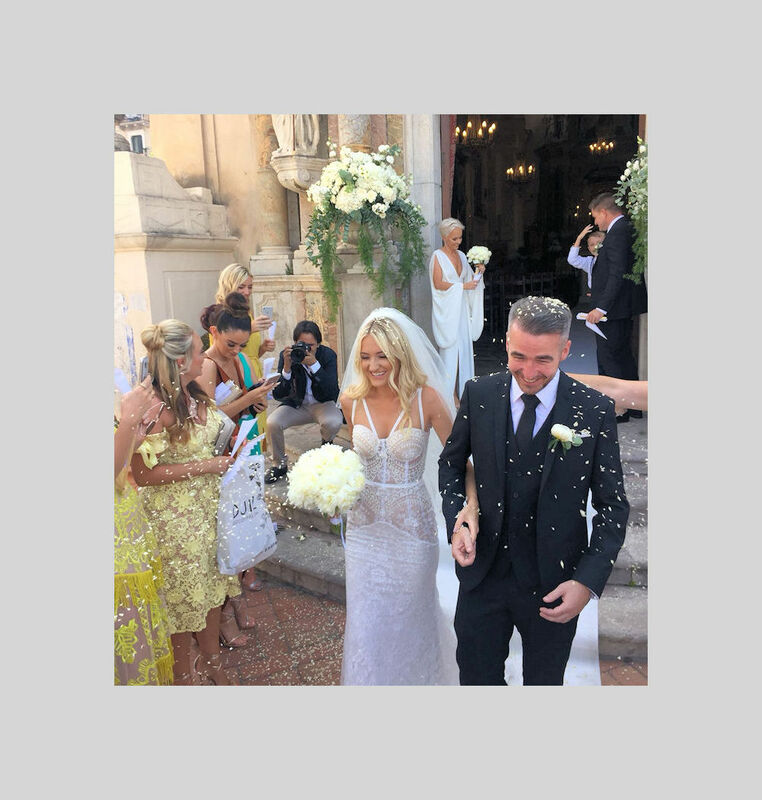 We had the most amazing wedding in Taormina and I hope this is helpful to read if you decide to have your wedding in Taormina, I would highly recommend Isabella as your wedding planner! Michelle and I cannot express how grateful we are to you both for helping make our dream wedding become a reality. When we decided to book our holiday to Sicily last year, that's all it was, just a nice relaxing holiday or at best, a possible honeymoon destination. Never in a million years did we invisage booking our wedding here, but visiting Taormina was like a love at first sight experience, so that's exactly what we did. Within a few days of our stay and looking at weddings taking place one evening after another, we asked ourselves the question, could you imagine yourself getting married over here and just how magical would that be? If somehow it worked out, maybe we could get a few family and friends to come over and join with us in our celebration. So now that we were entertaining the idea, it was from here that we decided to try and make contact with a wedding planner just to see how much was involved in getting married abroad. We knew our window of opportunity was closing fast, as we were due to fly home to Ireland in a few days. That evening we sat down down for a meal. It was early enough and the restaurant was quiet, so we chatted away to Giuseppe the owner, saying how beautiful Taormina was, and what a beautiful place to get married. We asked him if he had ever heard of a wedding planner by the name of weddinginsicily. As luck would have it, not only did he hear of them, he had Isabella’s phone number in his list of contacts. He rang Isabella, handed me over his phone and before we knew it, we had scheduled a meeting with her the following evening. The following evening came and we met up with Isabella to discuss the possibility of a Sicilian Wedding with her. From the first moment we met with Isabella, we could sense her energy and passion. As it was close to where we were staying, she brought us down to view the Palazzo Duchi De Santo Stefano which was a venue for civil ceremonies. It was beautiful and exactly what we were looking for. Afterwards over a coffee, we discussed everything that her services provided. Isabella had this professionalism about her, that she just made it all sound so effortless and wonderful. Fortunately for us, Isabella was organising a wedding the following evening and invited us both along to see exactly how it was run, we just had to stay in the background. We could see the excellent working relationship she had with her team of contacts and even introduced us to some of them. Everyone was so professional in their jobs, that everything was made to look effortless. Once Isabella was able to confirm our date with the registrar the following day, we booked her services immediately. After coming home from our holiday full of excitement. We stayed in continuous contact with Isabella through email and whatsapp and went through all of the necessary paperwork and bookings with her. Isabella advised us on when to start the process (Nulla Osta), where to post it off to when completed, and how long it would take. It all went exactly as how she said it would. Everything we asked Isabella to organise was done both promptly and professionally, and if there were any or alterations that needed to be made, then she would advise us with her expertise. When we arrived in Taormina, we met up with Isabella the following day to do a run through and finalise any remaining paperwork. On the day itself and with many family and friends around to help, Isabella was such a calming influence, that Michelle only wanted her in the bridal suite to help her with her dress. Everything had been organised on time and to perfection. Bride’s Hair & Make up, Guests transportation to and from the Wedding venue, Red Carpet, Registrar, Violinist, Harpist, Florist, Photographer, Christian’s Wedding Car, Sicilian Folk Band, Mocambo, La Baronessa, Wedding Cake, right down to the finest detail like the Corsages, Boutonniérs and Confetti. No job was either too big or too small. Looking back and reflecting on our day, if we had to do it all over again, we would not change a thing. It truly was a magical experience from beginning to end, and one that we will cherish forever. Even our guests were blown away, not only by the picturesque setting of Taormina for the wedding, but by the overall day itself. They said it was absolute perfection and could not compliment Isabella enough on the fantastic job both she and Tony did on our behalf. Isabella and Tony, we cannot thank you both enough for making our wedding day such an amazing experience. Choosing Isabella as our Wedding planner was not only the best decision we could have made, but we also gained two wonderful friends in the process. Isabella and Tony, we thank you both from the bottom of our hearts. We wish Weddingsinsicily continued success, and may you fulfil many more dreams as you did ours. We got engaged in December 2016 and knew that we wanted to get married in Taormina having visited previously and fallen in love with the town. We found Isabella’s website and after making contact with her, it was obvious she was friendly, approachable and very knowledgable about the area and the services available. It’s evident that her contacts and the places she recommends are of the highest standard. Isabella helped us choose the venues, the reception, flowers, photographer, hair and makeup, wedding car and a harpist for the ceremony. When choosing a somewhere to stay and places to honeymoon in Sicily she was also on hand with advice and plenty of information. Isabella helped us with every step of the process, including the paperwork, which I imagine would be very daunting without help. She was very organised and made the planning simple, and was always available to answer our questions, requests and for reassurance. Isabella would also contact us through the planning to let us know what was required from us at each particular stage, making things for us a lot more laid back. She also made suggestions we would never have thought of and it was the finishing touches and the attention to detail that made our day extra special. 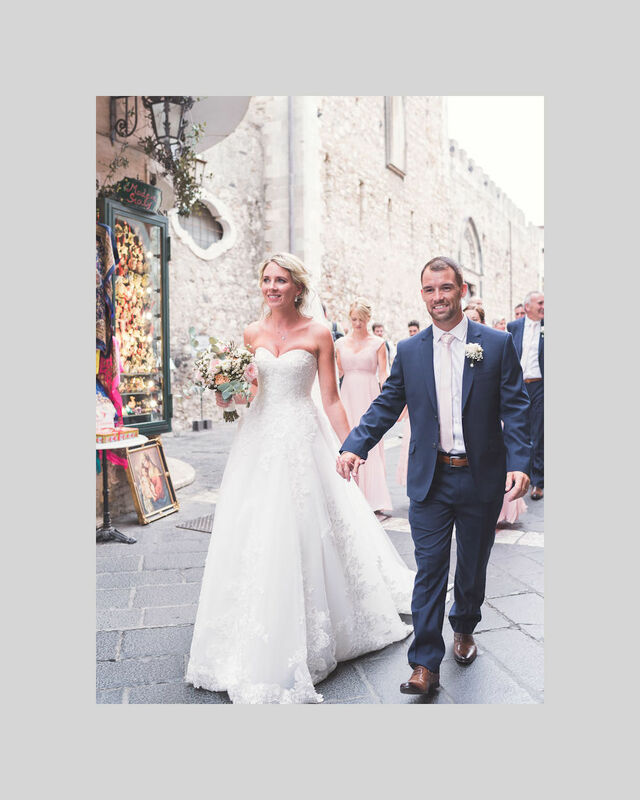 We visited Taormina a few months before the wedding in order to meet Isabella and Tony, and to view the venues and have a meal tasting and hair and make up trial. We met on several occasions throughout the visit, and were introduced to the various people and places that would be involved in our wedding. This made me absolutely confident that we had chosen well and we left knowing that everything was in great hands and were super excited to return to get married. When we arrived along with just under 40 guests for the week of our wedding, Isabella arranged taxis, made bookings for people and even ordered a cake and organised a birthday party for me at their bar, Time Out in the beautiful garden. 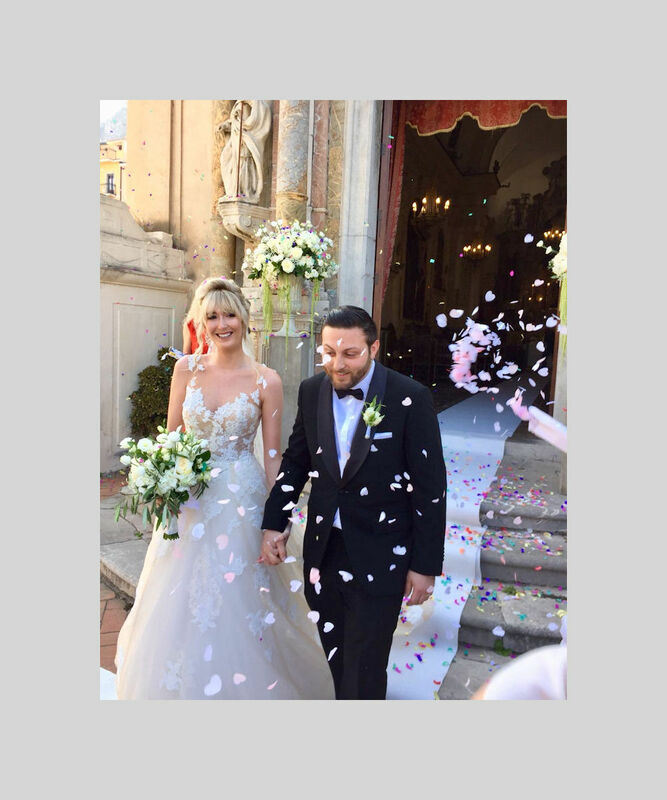 We got married on 1st August 2018 in Palazzo Duca di Santo Stefano and had a reception at Hotel El Jebel, with aperitifs at Mocambo bar on the Piazza Aprile. The day was amazing from start to finish and Tony and Isabella were present throughout to guide our guests and and allow us to completely relax. The day flowed seamlessly. Our guests are still telling us what a wonderful wedding it was and we all have fantastic memories of a truly memorable occasion. Everything exceeded our expectations. 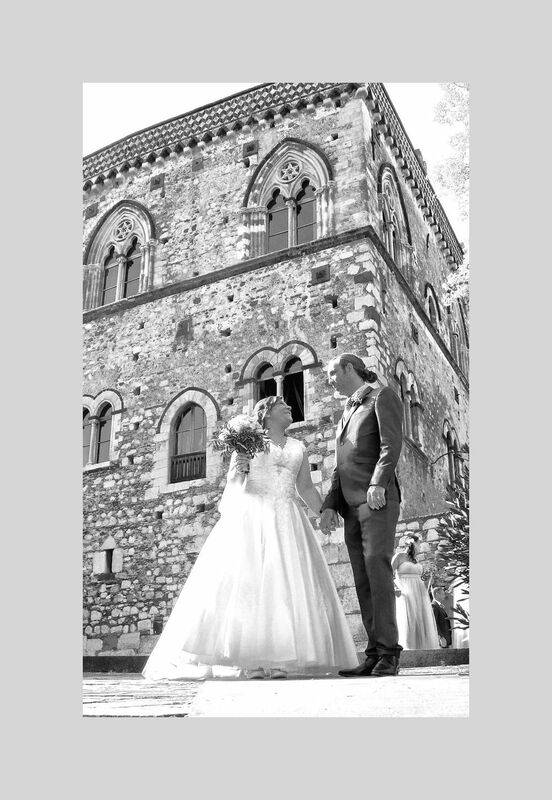 We would not hesitate to recommend Isabella and Tony to any couple considering getting married in Taormina. In fact, I think they are a must. They are such welcoming, dedicated and professional people and we are so grateful to them for making our day, and the planning that went with it absolutely perfect. Massive thanks to them for the best experience. From making sure that our paper work was completed properly, to ensuring then that every small detail was thought of. Isabella met with us the day before and talked us through every aspect ensuring that we knew the exact order of our day. Isabellas charges for her services are so reasonable in comparison to other planners I'd contacted. I have no hesitation in recommending Isabella to anyone being married in Taormina, she was wonderful. My advice is to choose your wedding planners wisely!! Your wedding planner will be the most important person during your wedding journey. They become a source of knowledge, a shoulder to cry on, a problem solver and if you’re as lucky as we were, they will even become great friends. If you are looking a professional, warm, welcoming wedding planner.... look no further. Without Isabella and Tony our wedding would not have been the same. They ensured that every moment was perfect and stress free. Their professionalism and eye for detail is amazing! Danny and I could not have asked for better wedding planners. Isabella and Tony arranged/ planned everything from venue viewings, legal and religious paper work, music, photographers, Dj’s, cars, flowers, hairdressers, transport....... basically everything. They could not have been more attentive, personable, helpful or professional throughout the entire planning process and wedding event. Nothing was too much trouble and our happiness and enjoyment was their primary concern. They ensured that all guests were looked after and even planned additional arrangements for my elderly grandmother. A massive bonus, not only for us, but also our guests was the hospitality they offered in their Bar (Time Out). This was often a meeting place for guests and the food is delicious. They also hosted the most fabulous pizza party in the Garden of Time Out the day after our wedding. Isabella and Tony were also able to recommend a range of different accommodation that suited the needs of our guests. They have excellent local contacts who all speak so highly of them. We could not recommend Isabella and Tony more, we are very grateful for everything. From the get go Isabella was efficient, quick to respond, helpful and most importantly, friendly! There was never a task too big and she always provided us with clear and concise answers to any questions we had, and there were many! It was a delight having Isabella be a part of our special day and we would have no hesitation in recommending her services to anyone. Taormina was a beautiful place for us to have our wedding and we couldn't be happier with our experience. Isabella was delightful to work with! She thought of every detail, even though it was a small symbolic ceremony, just the two of us. Isabella made everything so easy, especially since we decided to do a ceremony fairly last minute (about a month out). She was wonderful to communicate with and made us feel like we were the only ones she was working with; extremely attentive and she made time to meet with us the day we arrived in Taormina to discuss all the final details. The flowers, photographer (thank you, Max!) and location Isabella arranged for us were all fantastic. She even helped coordinate a post ceremony celebration for the two of us. We are forever grateful, thank you Isabella! On behalf of my husband and I, we would like to say a very sincere thanks to Isabella and Tony from Wedding In Sicily for all their help with organising the best day of our lives. When we first visited Sicily in July 2017, we went with the intention to see if Taormina would be suitable location to get married. We fell in love with Taormina the moment we arrived and knew that we wanted to get married in this magical Sicilian town. 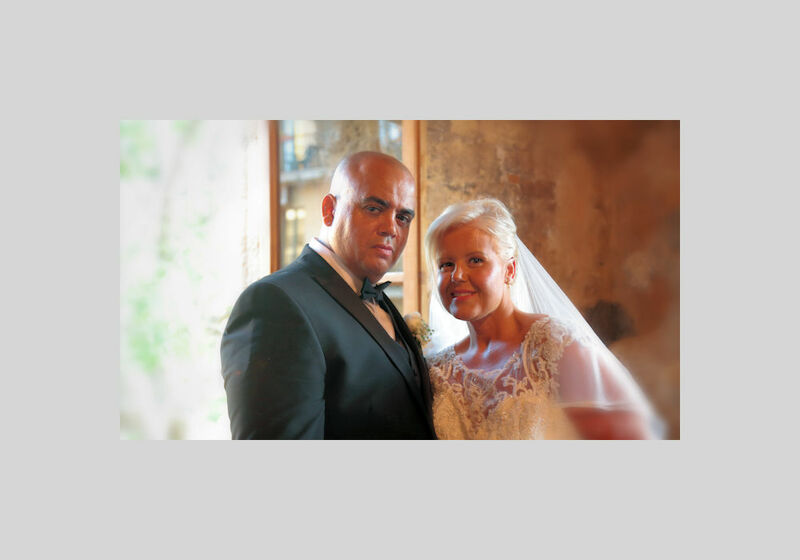 Fate intervened and we were told about this wonderful couple Isabella and Tony who specialised in planning weddings. We instantly hit it off with Isabella and Tony, and knew that our wedding would be in safe hands. Isabella and Tony got to know us very quickly and this helped to make suitable recommendations based on their expertise. We had visited a few hotel venues before we met Isabella and Tony to see if they would be suitable for our wedding reception and none of them felt right. Isabella recommended the Caparena Hotel and took us to visit it, we instantly loved the venue which was located beside the sea. From then on every decision we took regarding the wedding was based on Isabella and Tony's advice and recommendations. With Isabella's advice we agreed that we wanted to get married in the beautiful Santa Caterina Chapel so she booked it and the Caparena hotel for us before we flew back home again to Ireland. Over the next few months Isabella helped us with all the legal and religious paperwork and made this part of the process so straight forward. Isabella also booked photographers, musicians for the church, the English speaking priest, a Sicilian folk band, wedding car, DJ, hairdresser and beautician, liaiased with the florist and arranged the transport for our wedding guests. She also sent us a list of hotel and apartment accommodation which I was able to send out to the guests with their invites. Isabella kept in touch with us throughout the months leading up to the wedding, and answered all questions and queries instantly. 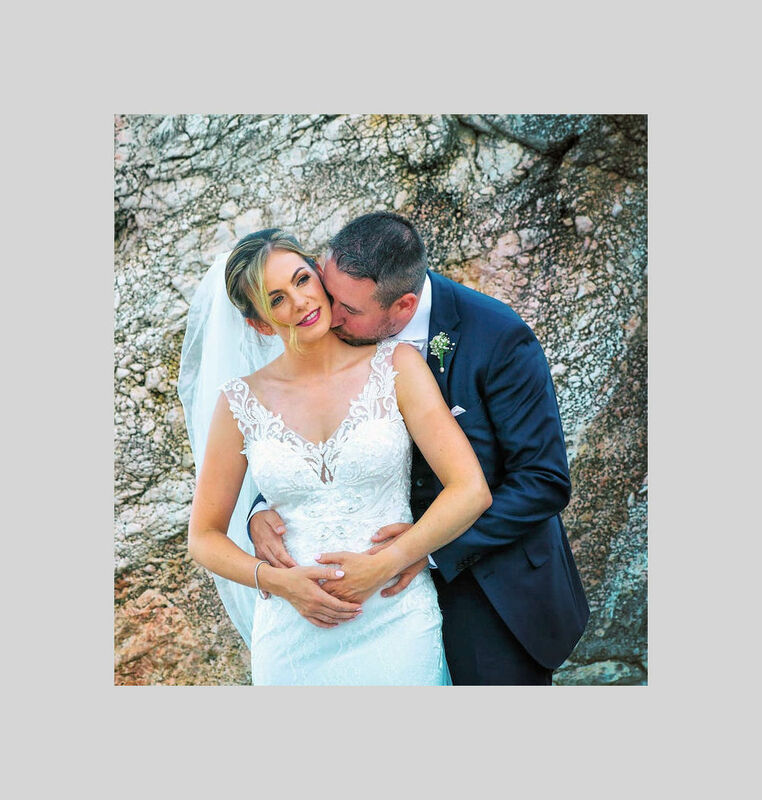 I can honestly say that we did not experience any stress which one normally associates with planning a wedding, as Isabella and Tony made the planning process so easy and hassle free. 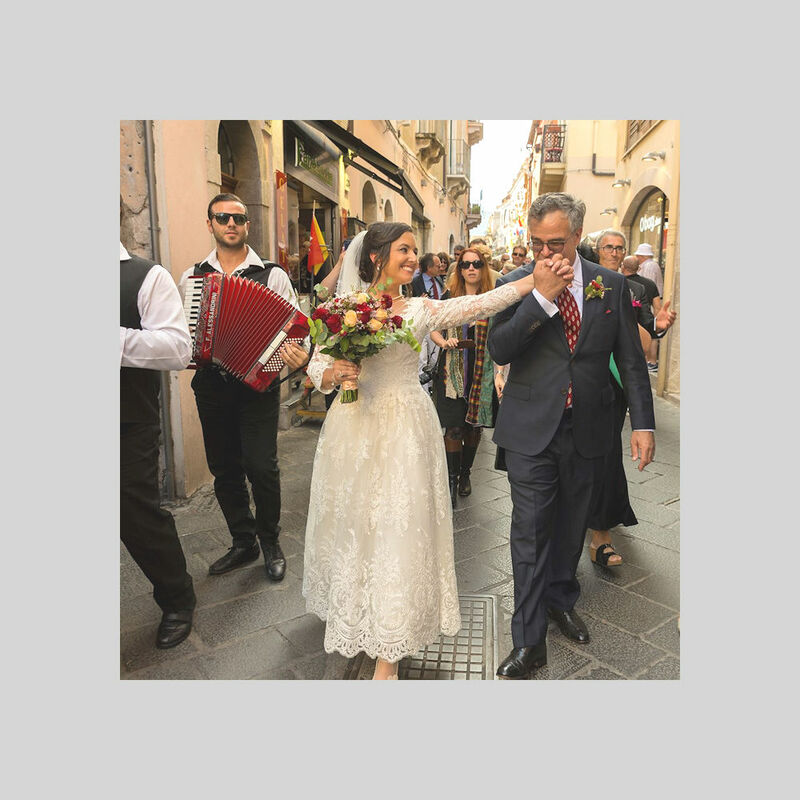 When we arrived in Sicily for the wedding, Tony and Isabella were on hand all the time in the days leading up to the wedding. The actual wedding day was amazing, all of Isabella and Tony's careful planning paid off and everything went like clock work. Our family and friends were amazed by the level of detail Isabella and Tony put into the wedding and everyone had an amazing time. They also loved the fact that Tony owns the Time Out Irish Pub, and it was the meeting point for our guests whilst they were in Taormina and was a great venue to watch the world cup. We are indebted to Isabella and Tony as they played a key role in making our wedding day magical. We can not recommend their wedding planning services enough and count them as two of our most favourite people in the world. From the first email response from Isabella we felt confident she was going to be the perfect wedding planner for us. We had almost chose a church/restaurant wedding when I completely changed my mind and decided to have the whole thing outdoors at the beautiful Caparena hotel. Isabella straight away reassured me that I had to go with my gut and so we booked our dream destination. On the run up to the wedding we would get an email from Isabella to let us know it was time to book another service such as flowers etc. Isabella always listened to what we wanted and not once did we ever feel pressured into a decision. It was also very easy to keep track of our wedding budget as she was very open with prices. When it came to paying off our wedding there were no hidden costs at all. When we arrived for the wedding we met Isabella and Tony in the Time Out bar (which quickly became a meeting point most evenings for our guests because of the gorgeous garden area). They were both so friendly and welcoming and we had a great night together getting to know each other. Before our wedding Isabella accompanied us to any appointments and organised the DJ and florist to meet us at the Caparena hotel before our tasting menu to ensure we were happy with everything. The wedding day was even better than we could have imagined, everything ran perfectly and we were just ushered from area to area to enjoy the day. A couple of times during the day we literally had to pinch ourselves because it felt so surreal. Our guests had an amazing time and repeatedly said how it was the best wedding they’ve ever been to. Without a doubt this was down to Isabella. If you want the most amazing wedding, that is completely stress free planning, in the most beautiful destination of Taormina, Isabella is the best choice. We couldn’t recommend her enough. We have just returned back home to Ireland after our wedding in Taormina, wow what a beautiful place. Isabella arranged to meet us 2 days after we had arrived (3 days before the wedding) to visit the ceremony venue, canapes venue and sign all the paperwork at the registrar’s, we also met the next evening for a tasting session at the reception venue. 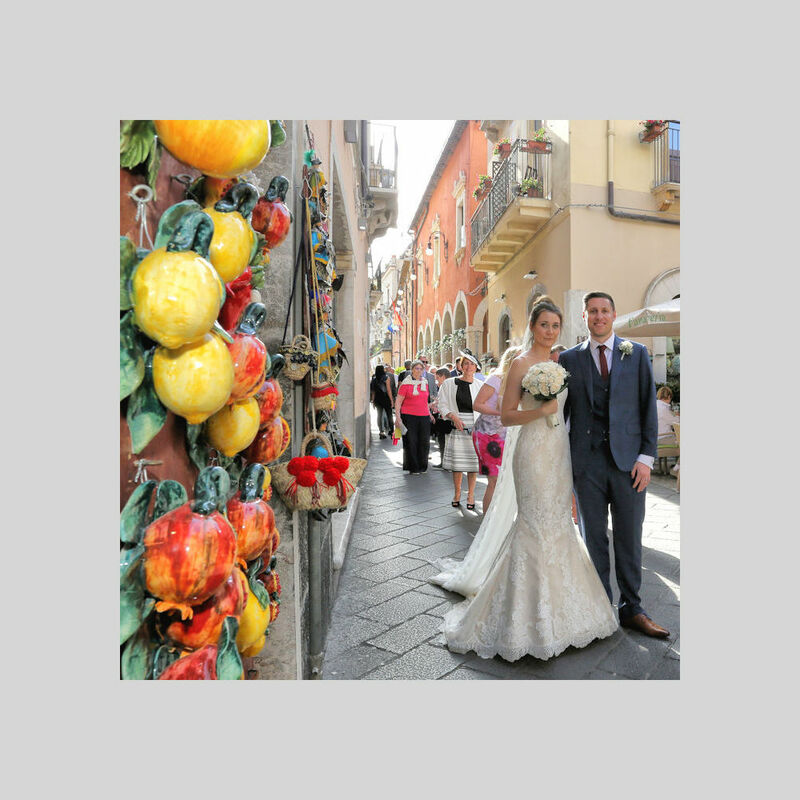 We had never been to Sicily or Taormina prior to arriving for our wedding, so we were very worried that things had been organised and everything arranged for us. As soon as we met Isabella and Tony all our worries were put to bed. What an amazing couple! We had been communicating for almost a year via email, and everything was arranged this way, from choosing the ceremony venue, canapes venue, reception venue, flowers, photographer, hair and Make up, wedding car, folk band, and the mandolin and classic guitar players. Isabella and Tony were so welcoming and warm when we arrived, we knew straight away we had picked the right people to arrange our wedding for us. We had chosen a hotel to stay in and when we let Isabella know which onen she advised us that it was very far from the town and suggeted some other hotels which were more local and suitable for us. At each point in the process Isabella gave me a step by step run down of what we needed to do and when it needed to be done. We thought the paperwork would be a nightmare to sort out, but with Isabella’s guidance it was as easy as anything to arrange. Isabella sent us many choices of venues for the reception and eventually we chose Villa Antonio which was perfect for us. It was a beautiful venue overlooking the sea. We chose our own menu and the owner was so accommodating to us, with certain requests. They even gave us a choice of wedding Cake design and made it for us. The service at Villa Antonio was second to none, and everyone couldn’t do enough for us they went above and beyond. The florist Isabella recommended did and excellent job and the flowers were exactly as I had chosen, my bouquet, the button holes, bridesmaids flowers and table decorations were absolutely gorgeous. I was delighted with them. The hair and make women did a fantanstic job. They were also recommended by Isabella. They arrived on time and together we chose the look I was going for which they achieved perfectly. Isabella and Tony were with us from start to finish on the day to make sure everything ran smoothly. Which it did. They guided us through everything as and when it was happening and made sure all the guests arrived and were seated before my arrival at the ceremony venue. They had arranged a mini bus to take the guests to the reception venue and made sure everyone got there while me and Paul travelled in a stunning vintage beetle. All in all we had the most amazing day, nothing what so ever went wrong, and everything was perfect. This is all down to the excellent professional service Isabella and Tony provide. They make you feel like old friends when you meet them and go over and above to ensure your day is as perfect as it you dream it to be. We honestly could never have done it without them both, and really look forward to visiting them both in their bar (the Time Out Pub) in the future. 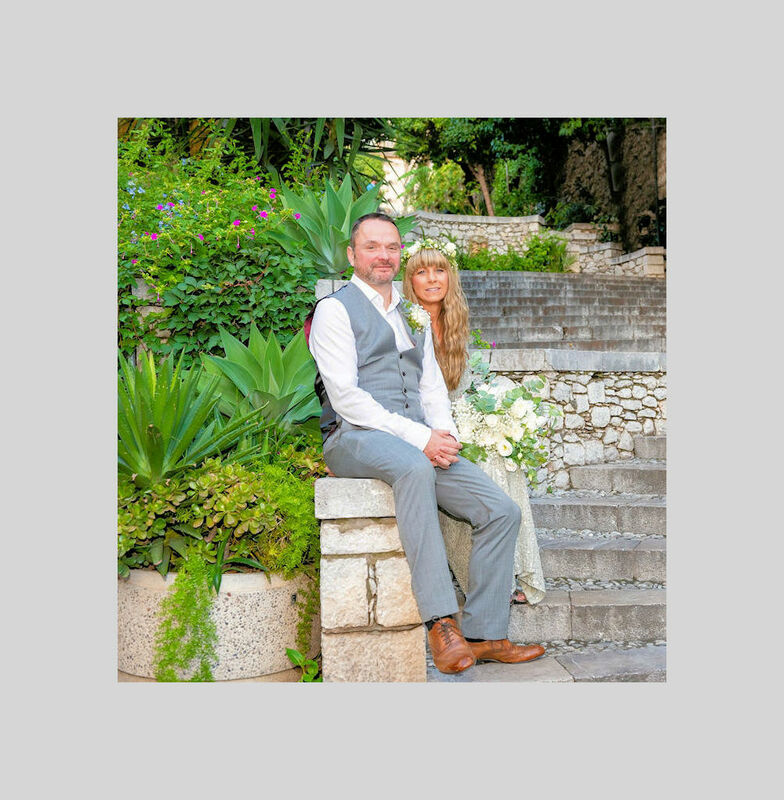 Me and Paul would like to say a massive thank you for making our day as perfect as it was, and we highly recommend weddinginsicilytaormina to everyone who is thinking of getting married in this beautifully stunning place. We chose to get married in Sicily as my Husband's family originate from Sicily and mainland Italy. I typed in 'Weddings in Sicily' in Google and Isabella and Tony's website was one of the first on the list. After reading other people's reviews and seeing the services they offered we decided to contact them to get more information. We received a prompt response with lots more information and decided to book a holiday to visit Taormina and meet Isabella. Isabella was very helpful and personally took us to the different churches and reception venues. We had a very set idea in mind of what we wanted - a church ceremony with a reception overlooking the sea. During the next 12 months Isabella kept in touch and informed us of the necessary steps along the way including the legal and religious paperwork. Even our Priest was impressed with her organisation! The florist, hair & make-up and the transport was all taken care of. Isabella and Tony also looked after our guests at their pub 'Time Out' which our wedding guests really enjoyed and was a great meeting point for everyone during the wedding week. The day of the wedding itself ran with perfection. Isabella and Tony organised timings and looked after the guests while we were having our photos taken. We didn't need to do a thing. I highly recommend the Sicilian folk band, they played as we walked (and danced) through the streets of Taormina which was one of the highlights of the day. We nearly didn't book them but so glad we did - our guests absolutely loved it and the locals all came out to congratulate us. I would also recommend that you choose a venue that Isabella personally looks after, we decided on venue that Isabella doesn't manage and liaising with them directly was very difficult. Isabella now has a lot more 'sea view' style venues that she manages which unfortunately were not available when we visited. The only regret I have is worrying too much! A number of our guests have said it was the best wedding they have ever been to which is an amazing thing to hear. Thank you Isabella & Tony for your kindness, hospitality and helpfulness. Our wedding day was one of kind. We went out to see Isabella in Taormina 8 months before our big day to look at possible venues for our wedding and reception. She showed us around the wedding venue as well as the reception venue and the restaurant were even kind enough to put on a complimentary tasting evening for us to taste some of our potential menu choices. Our big day soon arrived and the ceremony venue and reception venue looked stunning. The food was amazing and the service we received on our big day was outstanding. Isabella was on hand the whole day to make sure everything went as smoothly as possible. What should have been a fairly stressful time, Isabella made stress free. She took care of beauty appointments, hair, makeup, booked taxi for guests and much more. We even enjoyed a lovely pizza evening in the garden of Isabella and Tony's bar the evening after the wedding, so that the whole family could be together again in a less formal, more relaxed environment. This was also a lovely evening. We wanted to say thank you to Isabella and Tony for making our wedding day truly special and memorable event. Anyone considering an Italian wedding, we’d highly recommend them. My wife and I became engaged in December 2017 and planned to have a very small civil ceremony a few months later. One idea led to another and we eventually settled on Sicily and, in particular, Taormina. We had no idea who to use as the wedding planner but we knew that the paperwork and timing was important. We made online enquiries and nearly settled on one, London based, company. My then fiancée found another wedding planner, Isabella Randazzo, who was resident in Taormina. Isabella was significantly cheaper and we couldn’t find any service the other company offered to justify to large difference in price. We decided to use Isabella’s service. Our wedding was to be very small affair with just two of our friends as witnesses. Isabella was able to give advice on hotels to use in Taormina and other places we intended to stay in Sicily. Isabella also organised a professional photographer. The wedding happened on 18 April 2018 and went perfectly. Using Isabella’s advice, we set the date to give enough time for the relevant paperwork to be done. We had fairly frequent email contact leading up to the wedding and Isabella did manage to reassure us during the occasional stresses associated with the paperwork in the UK. Once all the forms were sent to Isabella there were no problems. Isabella met us two days before the wedding and took us to the registrar’s office the following day. Everything went smoothly and everyone was cheerful and helpful. The wedding ceremony lasted about 25 minutes, with Isabella performing the official role as translator. The venue was an old palazzo, Palazzo Duchi Di Santo Stefano, which was just perfect. Again, everyone was happy and helpful and made us feel welcome. The two photographers did an excellent job in and outside the palazzo and then led us through the town, taking pictures in the beautiful old streets. Local people and tourists cheered and applauded us as we walked through the town. It was a wonderful day! Isabella was able to get the certificates and the photos (on a memory stick) by midday the next day, which was amazing and unexpected. We were also extremely pleased with the photos taken by the recommended photographers. My wife and I can now wholeheartedly recommend Isabella Randazzo and her company, Wedding in Sicily to anyone planning a similar wedding.